Missing a tooth can be a major source of embarrassment and make you hesitant to eat, speak or laugh around others. While you may want to fill the gap in your smile to improve your appearance and reclaim your confidence, there are also many health-related reasons to replace missing teeth. Fortunately, modern dentistry offers a variety of teeth-replacement solutions, including dentures and dental implants. Want to know more? Below, a dentist in Chevy Chase reviews the health risks of missing teeth and the best way to rebuild a smile. Bone Loss – Without teeth to stimulate and support it, the jawbone can slowly atrophy and shrink away. As a result, your mouth will appear sunken and aged. Difficulty Eating – Missing front teeth makes it difficult to bite off pieces of food, while a missing molar can hinder your ability to grind up tough foods like meat. Difficulty Speaking – Missing teeth can make it difficult to pronounce certain words. You may experience whistling, slurring or even spitting when speaking with others. 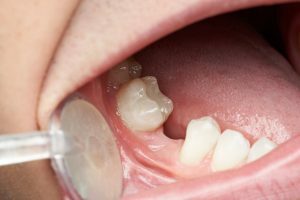 Shifting Teeth – Your remaining healthy teeth may slowly drift into the empty space left by a missing tooth, impacting your bite and making it more difficult to properly clean your smile. Bite Irregularities – Bite irregularities caused by missing teeth can affect the health of your remaining teeth, gums, neck, and jaw joint and muscles. Fortunately, there are several options to replace missing teeth and help prevent these negative health outcomes. Why are Dentures so Popular? Dentures are a popular and cost-effective solution for many men and women with missing teeth. Typically made from hard resin on top of an acrylic base, dentures can easily be removed for cleaning or to rest. They are also custom-designed to match the color of your gums and blend in seamlessly with your remaining healthy teeth. Partial dentures can replace one or several teeth, while full dentures can help restore an entire upper or lower row of missing teeth. For a long-lasting solution that provides maximum support, consider dental implants to replace your missing teeth. A dental implant is a titanium rod that is surgically inserted into the jawbone beneath the gums. By mimicking the natural tooth root structure, dental implants provide a sturdy base for replacement teeth and enable patients to eat and speak with confidence. Dental implants have a 98% success rate and can last for many years if cared for properly. Deciding which tooth-replacement treatment is right for you will depend on your unique smile and should be made in consultation with a Chevy Chase dentist. Never hide your smile again! Talk to a dentist today about how to rebuild your smile and reclaim your self-confidence. Dr. Ronan Freyne believes each patient is unique and deserves individualized care that meets their needs. The University of Medicine and Dentistry of New Jersey graduate provides dentures, dental implants, crowns and more to individuals with decaying or missing teeth. For more information on restorative dentistry solutions, visit Dr. Freyne’s website or call 301-986-0700.